The Grundfos Ecademy is a popular internet based learning tool that it designed to improve knowledge on pumps, applications and their theory. This digital training and information platform is available 24/7. Its aim is to help keep everyone with an interest in pumps and pump solutions informed and up-to-date on products plus a range of industry related themes. To keep it fresh and interesting, new topics are added on a regular basis. Recent subjects have included the new SCALA2 that is a new fully integrated, variable speed, water booster pump that has been specifically designed and built to deliver perfect water pressure to wherever it is needed in the home. Another new topic looks at the area of shower pumps, which is further broken down into two modules – An introduction to shower booster pumps and Grundfos shower pump solutions. These have now joined other product related topics plus more generic areas. The good news doesn’t end there, at the end of each module there is a short test and on successful completion of four of these, you will be given the opportunity to select a small gift. Today the Ecademy can be accessed from your smartphone, tablet or computer, which means that you can log-in whenever best suits your schedule. You can register for the Grundfos Ecademy by visiting www.grundfos.co.uk/ecademy. 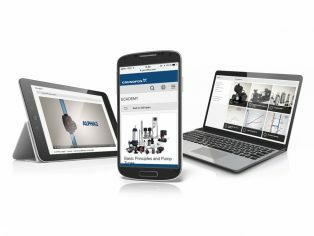 Once you have signed up, you will be able to use your log-in to access not just the Ecademy, but also other Grundfos web platforms such as the WIN & EARN loyalty scheme.